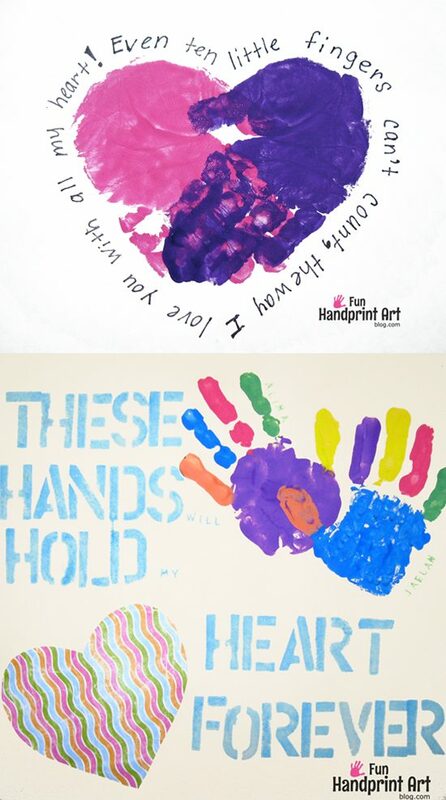 Handprint Keepsake with super cute saying! 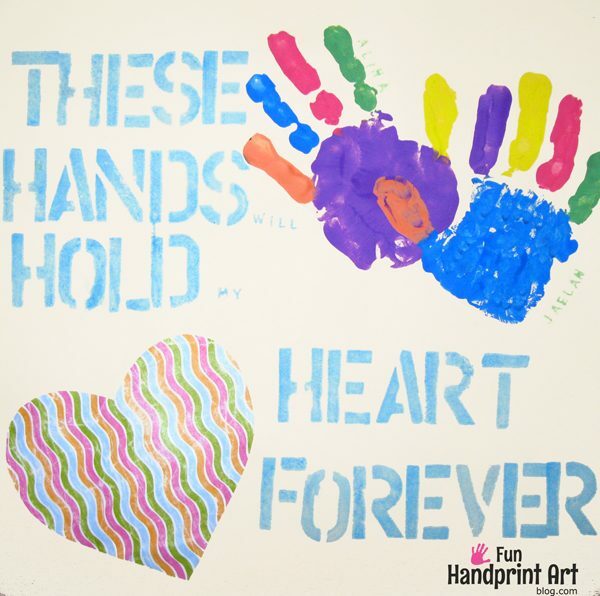 Remember the These hands will hold my heart forever keepsake canvas I made awhile back that was inspired by a gorgeous handprint canvas from Clean & Scentsible? Well, my friend loved it and wanted her kids to make one for their grandparents as a Christmas gift. Not only is it cute for Christmas, it’s also perfect for Valentine’s Day, Grandparent’s Day, Mother’s Day, & Father’s Day!!! My friend picked out a scrapbook paper that she liked and I cut a heart shape from it. I glued it to the bottom left corner of a cream colored 12×12 scrapbook paper. The kids wanted rainbow hands, so they painted them in colors that matched the heart. One kid made their handprint 1st and then the other pressed his down slightly overlapping his sister’s handprint. Using alphabet stamps and an ink pad, I stamped the cute saying. I love handprint art! I’m your newest follower. If you get a chance check out some of ours. Thanks for sharing! This is adorable! I love those alphabet stamps, too! Thank you so much for linking up to Teach Me Tuesday — I hope we see you again next week! I found you on Tip Junkie. Would you please share this with my readers for our Fun Stuff Fridays Valentine’s Linky Party? I think it would be a great fit. What a wonderful idea. Thank you! Great idea, Amanda! Adds a nice personal touch as a gift for Mother’s Day. I’ve included your project on my top 10 Creative & Easy DIY Gift Ideas for Mother’s Day.